Rayve Pet Soap is formulated with natural ingredients that keeps your pet clean, healthy while maintaining coat shine. This gives your pet a long-lasting and appealing fragrance. The type of soap you use makes a huge difference in how good your pets look and feel, as well as the luster and appearance of the fur/coat. Bathing pets at intervals will help deal with a lot of accumulated dirt, grime and prevents some skin infections. The use of scented soaps. Most pets breeds are good with a bath every month or two– even bushy or furry dogs. Rayve pet soap is gentle but effective at cleaning your pet while moisturizing the skin and adding luster to fur. It helps to condition, soften and remove tangles for easier brushing. Soap base, vitamin E, honey, fragrance, and natural oils. Honey hydrates, moisturizes (as a humectant, traps, and seals in moisture), soothes and softens the skin/hair coat. Its natural constituents have proven effectiveness in fighting infection, promoting new skin growth and lessening scarring. Honey derives its antibacterial effects from its high potassium content and natural hydrogen peroxide-produced by an enzyme naturally present in honey. 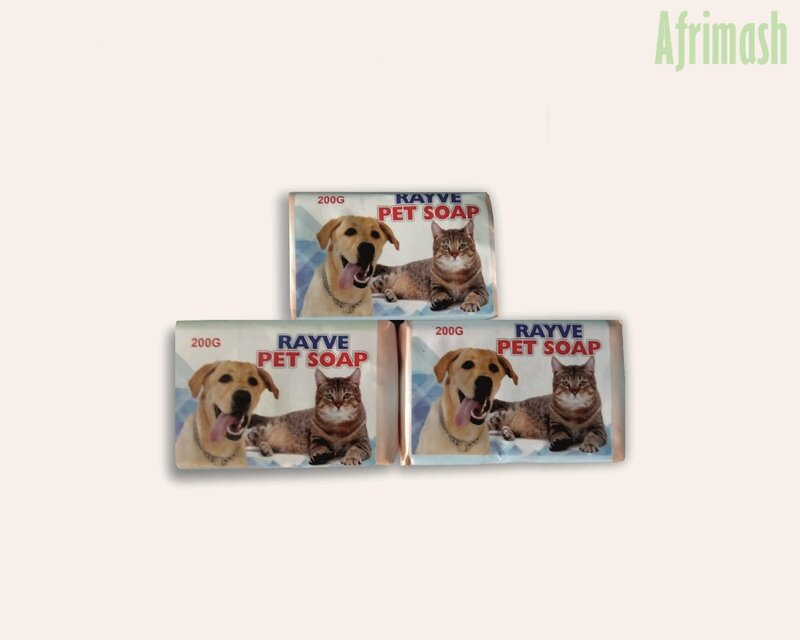 Rayve pet soap can be used on cats and puppies. It can also be used alongside the Rayve tick and flea powder for long-lasting protection. Using a bar of soap to wash your pet is often much easier and less messy than using liquid soap. Wet the coat with cold water. Rub the soap bar on your pet’s wet coat to make a rich, creamy lather. Gently massage deep into the pet’s coat. Leave for 3-5 minutes, then rinse thoroughly till the lather is washed off completely. Properly rub down the pet with a clean, dry towel.